Amazon Price: $69.99 (as of February 13, 2019 4:52 pm - Details). Product prices and availability are accurate as of the date/time indicated and are subject to change. Any price and availability information displayed on the Amazon site at the time of purchase will apply to the purchase of this product. The AQ-4000 Aquasana countertop water filter is the most economical way to get clean, crisp, healthy water for your family. Named one of Health Magazine’s Healthiest Gadgets for 2011, our countertop drinking water filter offers Aquasana’s unbeatable drinking water filtration technology in a convenient, portable package. This is my personal favorite and I’ve been using it for over ten years. The company gives excellent service. You can opt for an under the counter model if you’re living where you can make the counter hole etc. CLICK HERE for the under counter version. There’s no need for an extra hole in your sink with the countertop model, to enjoy healthy, filtered water. Simply attach our diverter to your existing tap, and the countertop unit takes up just a small space on your counter. Water under pressure means better filtration. Our unique twin cartridge system uses a combination of carbon filtration, ion exchange and sub-micron filtration. Your tap water is forced under pressure over filtration material covering more than two million square feet of surface area, so it removes over three times more contaminants than leading pitcher filters. Some water filter systems strip out the healthy Total Dissolved Solids (TDS) leaving you with zero calcium, magnesium and potassium. 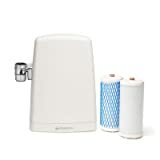 Your Aquasana countertop water filter comes with a diverter that attaches to your faucet and includes adapters for 13/16” and 15/16” faucets which fit most kitchen faucets. Some specialty faucets may require additional adapters. Dee's Shopping Help is a participant in the Amazon Services LLC Associates Program, an affiliate advertising program designed to provide a means for sites to earn advertising fees by advertising and linking to Amazon.com, Endless.com, MYHABIT.com, SmallParts.com, or AmazonWireless.com. Amazon, the Amazon logo, AmazonSupply, and the AmazonSupply logo are trademarks of Amazon.com, Inc. or its affiliates.